It’s May 8th and this is our rest day or more accurately our acclimatization day at 14,000 feet (4266m) in the village of Pheriche. Each member of this team has been doing great. As you know we have been moving slowly, we’ve met a lot of interesting people and seen some fascinating places along the way. This had led us to being very well adapted to altitude in my opinion but it always helps to stop at a critical elevation like this and allow your body to catch up or adapt. Now acclimatization isn’t really about exercise, often it’s about staying in one place long enough to let your body adapt to the lower air pressure at new altitudes and that’s exactly what we are doing today. Cam and Dan stayed back at the lodge meanwhile and just read books and relaxed, drank tea which is also acclimatization. Just being here is what it takes to prompt our bodies to adapt. Our lodge is full of expedition members from several different teams who have come down to recuperate in the thick air before they go back and make their final summit attempts on both Everest and Lhotse. 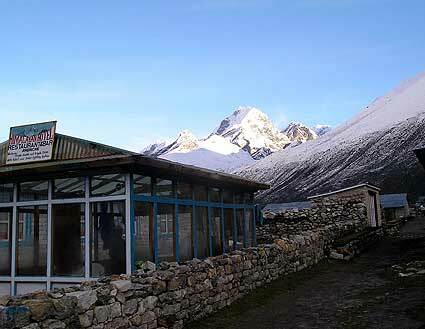 Pheriche is a sentimental favorite of mine on the trek to Everest Base Camp for this very reason. We always staged our expeditions from Pheriche and returned down here to rest and recuperate and seeing many old friends from both the foreign climbing community and especially from the Sherpa community has been really fun. We shared a lot of stories and laughs and the team members are sitting around absorbing some of the stories from this years Everest climbing scene. Well it’s about time for dinner back in the lodge. 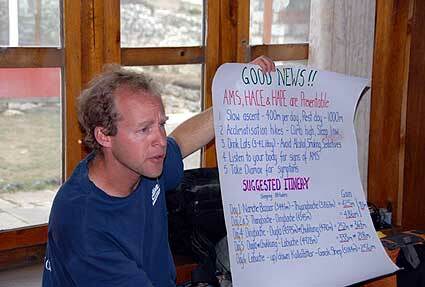 The team did go over at 3:00pm for the high altitude lecture given by the physician at the Himalayan Rescue Association Clinic right next to our lodge. We have one more night in Pheriche and tomorrow we are going to move up and literally walk up on to the terminal moraine of the Khumbu glacier. We are getting closer to base camp and we’ll keep you posted each day on the stories we have to tell about the people we meet and the scenes we see along the trail to Everest Base Camp.